With scarcely available ready A-grade rent-yielding commercial assets being taken up fast and the housing market no longer offering the kind of returns it did a few years ago, investors are now turning to other options such as warehousing, co-living, co-working spaces and even student housing to get the best bang from the buck. There is a major shift from investors putting in their money into small office spaces to co-working spaces. There’s also been a trend wherein investors are buying into large floor plates and handing them over to co-working players to manage such spaces on a revenue share model with their gains often working out to be around 13-14 percent IRR, said real estate experts. Another option is warehousing where investors are typically outsourcing it to a third party to manage the facilities. Debt is relatively cheaper because warehousing has been given infrastructure status. Loans under priority sector lending are at around 9.5 percent. Student housing is yet another option as it is a resilient and a risk averse segment. The concept of co-working spaces essentially involves groups of individual professionals and small and increasingly large-scale businesses who share workspaces. In an age when business cycles have dramatically reduced and companies need to constantly innovate to survive and remain competitive over the long term, a co-working workplace may provide the environment that fosters fresh thinking and innovation. Besides companies, people such as business nomads, expats or those travelling to the country for a limited period are amongst those preferring to work out of plug-and-play co-working spaces. Another constituent is the growing volume of freelance workers (gig economy) who support corporate entities with specialised outsourced services in the advisory, consulting and designing domain such as recruiting and advertising, says a Knight Frank report. Co-working spaces also enable the typical start-up to bypass the fixed rental cost with the additional capex requirements of fit outs and operational hassles of a traditional office space and opt for the flexibility of a co-working office. This not only allows the new business to occupy a contemporary workplace on a per seat basis but also the flexibility to increase, reduce or to exit the workplace. Of late, several developers are planning on starting their own co-working offices or collaborating with a co-working operator to provide incubation spaces, or divide large floor plates for smaller occupants. While co-working companies accounted for just under 0.2 mn sq mt (2 mn sq ft) of the 3.8 mn sq mt (3.8 mn sq ft) annual commercial office space transactions volume, the expansion plans of major players and the increasing appetite for this format from occupiers, property owners and co-working operators should see annual transaction numbers triple from current levels over the next three years. 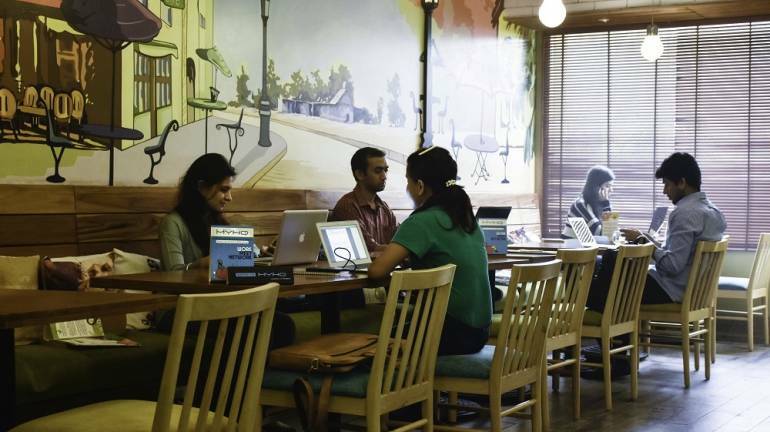 Currently, Bengaluru, Mumbai and NCR house most of the co-working stock in India followed by Hyderabad and Pune, says the report. Warehousing investment accounted for around 26 percent of the total private equity (PE) investments into real estate during January 2014 – January 2018. Around USD 3.4 billion (Rs 22,100 crore) of institutional capital has flown into this sector during this period. The actual size of capital movement would be higher, as these numbers only cover the major investments by organised players. New developments or greenfield projects accounted for 67 percent of the total investments followed by 27 percent for acquisition of complete projects, says a Knight Frank report. In light of the slump in the Indian residential market over the past few years and the track record of poor returns; investors preferred to invest in rent-yielding commercial assets. With increased investor activity in the commercial segment and the acute shortage in supply of good quality of office space, the cap rates are declining and inching below 8 percent from the 9–10 percent range witnessed a few years ago. The risk-reward ratio would start becoming unfavourable as the cap rates start to decline further below 7–7.5 percent. As a result, there has been a considerable shift in investors’ focus towards the warehousing sector, the report says, adding the warehousing assets are offering a higher cap rate around 150–200 bps greater compared to what commercial assets are currently offering, says the report. Going forward, demand for large warehousing spaces is likely to see steady increase as occupiers now to move out of their smaller warehouses and consolidate their activities in larger facilities, which are presently in short supply compared to the demand. This demand-supply gap is visible in the current premium commanded by organised players owning these assets. For example, in the Bhiwandi warehousing cluster, the rents for unorganised spaces are as low as Rs 9 per sq ft, whereas organised players are commanding rents in the range of Rs 14–17 per sq ft in the same region. As more and more companies streamline their logistics networks, unorganised players or smaller organised players would consolidate or sell their assets to larger ones. The industry is expected to witness a structural shift over the next 3–5 years. The warehousing aspect in the logistics supply chain globally is going through a transformation. From being a mere storage space provider for goods, the segment is offering an array of value added services such as packaging, small scale manufacturing, cross docking, automation, algorithm based demand forecasting and distribution centres. Warehousing will be in demand regardless of REITs simply because of the push for logistics infrastructure in the country. GST rationalisation, and the growth of e-Commerce are additional drivers for large scale warehouses in various locations. Additionally, with India’s logistic industry being awarded the infrastructure status there is more interest in the sector for investments. Investments in Tier 2 cities and the outskirts of metros is a good bet by as they are perfect for a hub and spoke model and allow for easy transportation, says Mudassir Zaidi, executive director –North, Knight Frank India. So, if you are interested in this asset class, look at investing in warehousing facilities that are not less than 30-40 acres. The IRR that this option is likely to fetch is around 18 percent, says Anckur Srivasttava of GenReal Advisers. Student housing offers opportunities both to those who have the appetite to invest and developers who could bank on it as a lucrative rental yielding revenue stream. Currently, there are several players in the student housing space who have entered the market knowing fully well that there is huge demand but lack of supply. These include Your Space; Oxfordcaps which offers premium student housing facilities in Delhi-NCR and is headquartered in Singapore and Stanza Living. As per a report by Federation of Indian Chamber of Commerce & Industry (FICCI) and JLL India, titled, ‘Future of India Real Estate: Deciphering the Mid-term Perspective’, student housing has the potential to yield more than 12 percent returns vis-a-vis the core commercial sector in which returns remain rangebound between 7 percent and 10 percent. This sector is expected to see a compounded annual growth rate of 38 percent to Rs 2,400 crore until 2020. It is currently worth Rs 1,267 crore. The sector is still at a nascent stage with the top 15 players dominating the organised space. They cumulatively operate around 84,500 beds and plans to grow to 1,60,000 beds by 2020. This segment is largely part of an unorganised market. Student housing players generally charge on a per bed basis with a host of facilities such as food, WiFi, laundry, security, gymnasium, leisure activities, independent kitchenettes, food delivery and even shuttle services to colleges thrown in. “Student housing is yet another option as it is a resilient and a risk averse segment. In case you wish to invest in this asset class, look for at least an option of 100 rooms. IRR expected to be around 12-13 percent,” said experts. Student housing is a relatively new concept in India. The government impetus on education, a young migrant population base and public private partnerships in the sector have changed how student housing was perceived. One of the main advantages of investment in this class is that it offers stability unlike others since there will always be a demand. “Mainly two models are prevalent in this segment, one will be where asset is owned and operated and the other model which is picking up in India is the only-operation model. Investment selection should ideally be closer to campus and offer ample connectivity. With all the pros, the student housing as an asset class is still growing and will require capital for asset generation and operation given the paying capacity of the target segment,” said Zaidi. In India, the co-living spaces opportunity is here to stay as the millennial population currently accounts for 440 million. The growing interest for co-living spaces in cities such as Bengaluru, the National Capital Region (NCR) and Pune has been instrumental in many investors sitting up and taking notice of this emerging sector to diversify their portfolio and risk. The renting philosophy for co-living spaces is derived from millennial behaviour where such renters share less utilised areas such as living spaces, kitchen, balconies, etc. in order to make an economical rental decision and be part of a working community. This trend is giving impetus to an organised rental market in cities such as Bengaluru, NCR and Pune in the same way as co-working spaces did for shared office spaces. With the Indian home renting market estimated at $32 billion, investing in the co-living sector presents a new asset class for investors to diversify their risks. Since the co-living model allows sharing of lower utilisation areas such as kitchen, living rooms, the design of these products is such that it allows more people to be accommodated on the same floor plate and generate more rental income from it. The co-living sector is at a nascent stage, with low entry barriers a higher rental yield between 10–13 percent can be achieved, according to a Knight Frank report. “Co-living and co-working is mainly targeting the same cities where housing and office space is expensive. Typically, both will be an agreeable option for new start-ups and young employees that want to stay flexible and will look to move or upgrade in a short time frame of time. Cities that drive employment such as the IT capital of Bangalore, Gurugram, Pune, Chennai are going to be ideal places to invest in these asset classes,” added Zaidi.